Students participate in You+Me=Us, a workshop about negotiating healthy relationships. On Mar. 4, young men and women from Westview, Emery, Jeffreys and other secondary schools in our area met at York University’s Student Centre and shared how women and men can better understand and appreciate each other. The BeLovEd movement sponsored this event. The Black Creek Community Health Centre launched this education campaign in 2009 to promote healthy relationships between genders. Lisa Brown, of the Black Creek Community Health Centre and comedian Owen Blakka Ellis co-hosted the event. Other leaders were Kevin Sutton of the Toronto District School Board’s (TDSB) Equity Program, Kelli Leizer, teacher at Westview, Jason To, teacher at C.W. Jeffreys, Carmen Fuentes, teacher at Emery and Jen Wheelan of York University social work. Sgt. Steve Hicks of the Toronto Police Services 31 Division gave an inspiring talk on how to avoid unhealthy relationships. The following are student’s personal stories of their impressions of the gathering. Recently, I had the privilege of attending an awe-inspiring conference at York University, led by the BeLovEd Movement where I participated in some incredible workshops. 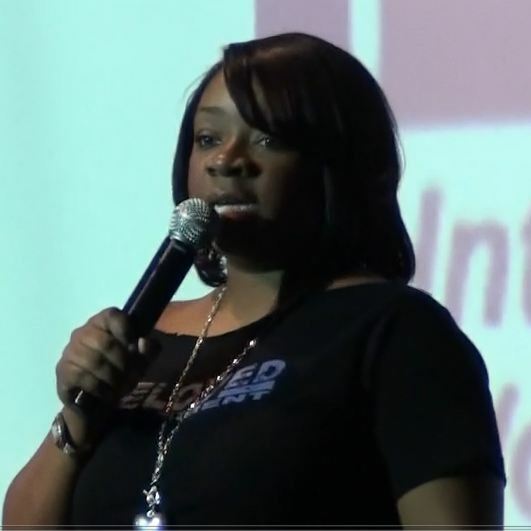 The purpose of the conference, entitled Be Inspired, Love Yourself, Educate Others held on Mar. 4 at York University, was to instill inspiration, love, and greater knowledge into the students who attended. As someone who was in attendance, I can honestly say that they had successfully achieved their goal. The conference, which coincided with International Women’s Day, delivered a powerful and important message through fascinating speeches, video screenings, and performances. We were educated on everything from healthy relationships, to gender stereotypes, as well as the prevention of violence against young women. Overall, the theme of this entire day was the importance of equality: treating everyone equally regardless of their gender, ethnicity, sexual orientation, or class. Participants debate what should go in to a "man box" during a seminar called "Deconstructing the Hype: Gender-based Violence 101"
The people I met, the speeches I heard, and the workshops I took part in taught me that love and acceptance should be the guiding forces in our lives. I hope that one day, for the sake of our mothers, daughters, sisters, and suffering females around the world, love will finally overcome hatred, and violence against women will be a thing in the past, never to be looked upon again. 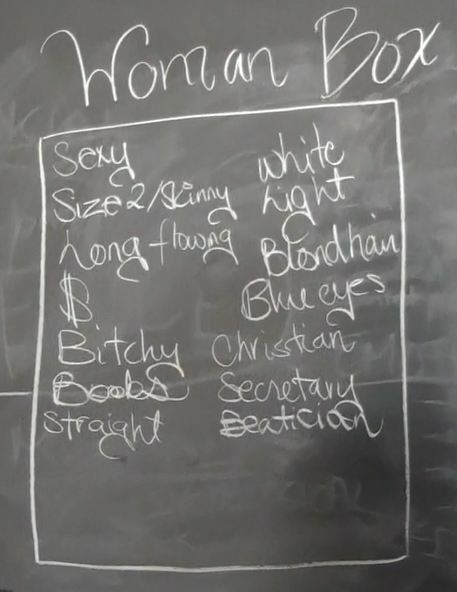 During the "Deconstructing the Hype: Gender-based Violence 101" workshop, students came up with ideas to place in a "woman box"
At the BeLovEd Movement Conference, I increased my knowledge about abuse and brutality towards women. The entire Generation Change group and I watched videos about relationships, then as a group we discussed and gave our opinions about them. After, the Generation Change group had split up into smaller groups, we talked about different topics, including, people who are survivors of emotional and physical abuse in their every day relationships. I was in a group established for guys only. What I learned was, women, can influence how a man acts. For example, when a man is with a woman, he wants to portray himself as a tough, cool, smooth guy, without any feelings. However when he sits among men he is comfortable with, he can express and talk about his feelings much more. After all, the day was successful and awesome. I am glad to be a part of Generation Change and I thank all of the coordinators and sponsors for putting together this wonderful learning experience. Staff of the Oakdale Golf and Country Club volunteered at the Gala to help reduce costs. Green Change Agents pose with representatives of the major sponsors of the Gala, the Oakdale Golf and Country Club and Carpenters Union, Local 27. Jane Finch Youth Steel Pan Group plays to guests as they enter the Gala. CBC News Co-Anchor and Gala Co-Emcee, Dwight Drummond, with Inspector Tony Riviere of Toronto Police Services, 31 Division. All photos by the community photographer. 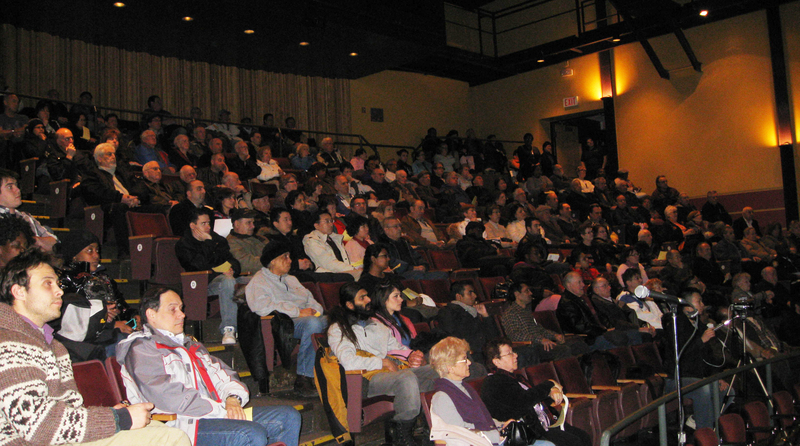 More than 200 local residents attended a town hall meeting held by Councillor Anthony Perruzza at the York Woods Library Theatre on Feb.22. 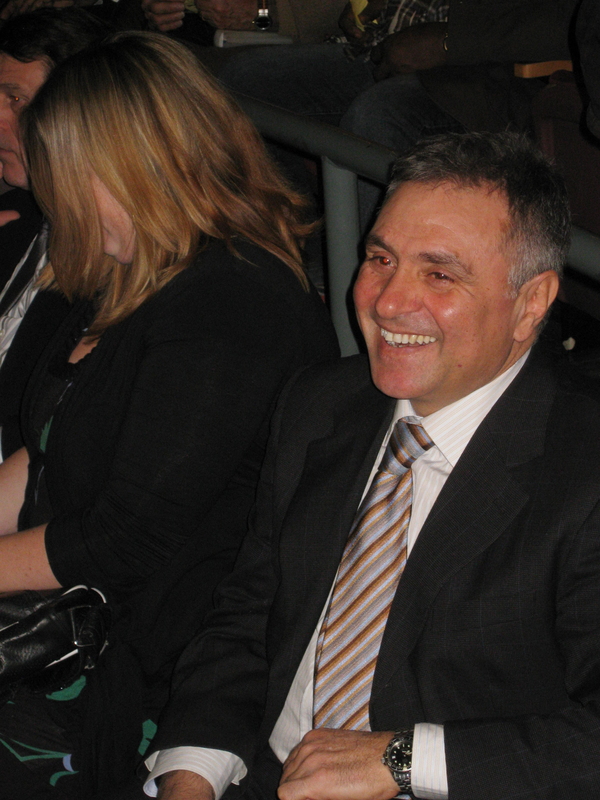 Councillor Anthony Perruzza (Ward 8 ) held a Town Hall meeting this last Tuesday, Feb. 22. With over 200 people in attendance, local residents had an opportunity to talk local politics with their councillor. There were presentations from different City departments: Ted Zander, Resident Superintendant with the Spadina Subway Extension Project gave a presentation on the transportation plan that deals with subway construction. Josie Lavida, Director of Financial Planning, gave an in depth presentation on the City’s budget report for 2011. Her father, a local resident, was in attendance. Bill Blake, District Manger of Municipal Licensing and Standards, gave a presentation on the MRAB program, which audits multi-unit tenant buildings to ensure a high standard of maintenance and has had a serious effect on a number of local buildings in Ward 8. Among the topics discussed at a Town Hall Meeting held by Councillor Anthony Perruzza (above) were public transit as well as the effect that budget cuts could have on the local community. Residents also had an opportunity to ask questions, which ranged from the effects of budget cuts on local programs, like the basement flooding program, to public transit questions. The meeting was also attended by activists from www.ttcriders.ca which are working to save the construction of the future LRT line on Finch Avenue West. The line was due for construction in the coming years, but the current mayor has recently announced that the money for this part of the public transit project slated for this community will now be spent elsewhere. 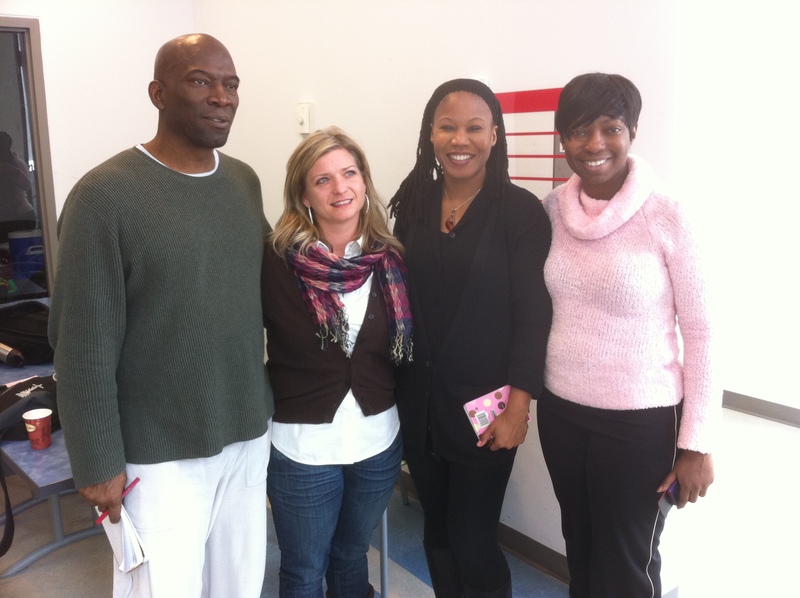 Majora Carter said she has something in common with the Tea Party movement in the United States. Carter, a renowned environmental activist from the South Bronx, N.Y. made this bold statement when delivering her keynote address for the Green Change Exposition and Gala, sponsored by the Jane-Finch Community and Family Centre on Feb. 12. On paper, one might assume that Carter, who now runs her own environmental consulting firm, The Majora Carter Group, has spent more than a decade actively campaigning for environmental sustainability, particularly in at risk neighbourhoods, would have little, if any common ground with the populist movement which is sweeping up many parts of the United States. For starters, Tea Partiers, as they are called, are generally opposed to any sort of government spending on social programs, preferring to leave such endeavours up to the will of individuals and the market. In her speech, Carter, however argued that creating environmentally sustainable initiatives is not more costly to the average taxpayer, but, in fact, it will save them money in the long run. Carter explained that environmental sustainability can be a win-win situation for the environment, taxpayers and especially for communities facing severe economic challenges. According to Carter, many people in at risk communities feel as if there is no hope for them and this in turn, leads to a higher incidence of crime. Carter said legitimate opportunities can be created around green jobs. “Those are the type of jobs that if you realize it, making investments now, actually pays you back in the future and it makes people instead of becoming tax burdens, they become tax payers,” she said. Anthony Perruzza, Toronto city councillor for Ward 8, said that on a smaller scale, some of these initiatives are beginning to happen in the community. “I agree with [Carter] very profoundly on the notion that if you take care of the smaller stuff at a community level, then the big problems nationally and internationally take care of themselves and it’s really up to us on a community level and at a local level to focus and produce some of those results,” he said. One example of this is the Centre for Green Change, the organization for whom the exposition and gala was raising money towards, has been involved in many environmentally positive initiatives in our community through their many green change agents. In addition to this work, the Centre for Green Change has already created two dedicated community gardens at Toronto Community Housing Corporation (TCHC) properties at 2999 Jane St., 4400 Jane St and are looking at creating one at Shoreham Court in the spring. In order to continue with their initiatives, they have received dedicated space from TCHC at 2999 Jane St. However, that space needed to be renovated at an estimated cost of $500,000 and so Powell said the organization decided to turn their second annual Green Change Gala into a fundraiser event to help make this possible. “This year our aim is to raise about $30,000 on our own to combine with other funds that we’ve requested from the government and also other partnerships,” she said. One of the partnerships the organization has is with the Carpenters and Allied Workers Local 27, who have donated their time and expertise to help with the renovation process as well as partially funded Carter’s speaking engagement. Yorke said that local 27 training instructors would be involved in helping community volunteers to complete the renovations. Carter ended off her speech with a quote from Martin Luther King Jr., stating that there is a “legitimate and unavoidable impatience,” in order to create a green economy in communities such as this one. “We have people that are suffering for no good reason and we’ve got an opportunity to make that we can use right now that can impact everyone positively including our national debts so for that I think there’s no reason to wait at all,” she said. Anthony Perruzza, city councillor for Ward 8 will hold a town hall meeting at the York Woods Library theatre on Tuesday Feb. 22 at 7:00 p.m. Topics for discussion are the 2011 city budget as well as an updates on TTC subway construction and transit on Finch Ave. W.
Feb. 22: InCharge Canada Debt Solutions for Life: A Personal Finance Workshop, from 6:00p.m. to 8:00 p.m. York Woods Library, Meeting room 2. Register in person or by calling 416-395-5980. Feb. 23: Andrew Craig, motivational speaker and CBC radio host visits the York Woods Library Theatre from 10:30 a.m. to 12:00 p.m. Register in person or call 416-395-5980. Feb. 24: African music and dance performance York Gate Mall at 5:30 p.m.
Feb. 26: Screening of The Hope dealer, a film about a martial arts instructor who inspires and changes the lives of at risk youth at York Woods Library Meeting room 2 from 3:00p.m. to 4:00 p.m. Discussion to follow. Register in person or call 416-395-5980. Mar. 2: Lost and Found: (Finding) Hidden Beauty in the ‘Hood group exhibition at the Art Gallery of York University on from 6:00 to 8:00 p.m.
For Bruno d’Andrea, Scouting is in the blood. ”When I put on my uniform, I feel like myself. I get so much energy from it,” he says. For more than 30 years, Bruno has directed that energy towards meeting the needs of 11-16 year old boys and girls for fun, discipline, nourishment and love every week at Scout meetings held at St. Augustine of Canterbury, and most recently, at St. Charles Garnier Catholic elementary schools. Over the years, the Scout Troupes have always been as diverse as the community itself, not only culturally, but also religiously, as can be demonstrated by the leaders themselves. Bruno is a Christian, his co-leader of 20 years, Mandy Saadia is Jewish, and their third leader, Amananth Hosein, is Muslim. Bruno’s dedication to Scouting started with a love of the outdoors passed down to him by his father in the mountainous region of Italy called Abruzzo. 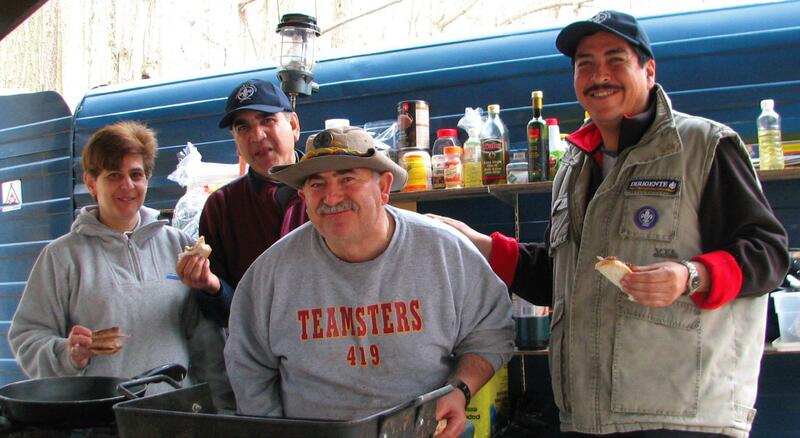 Bruno came to Canada at the age of 18 and within 5 years, he got married and started his own Scout Troupe. 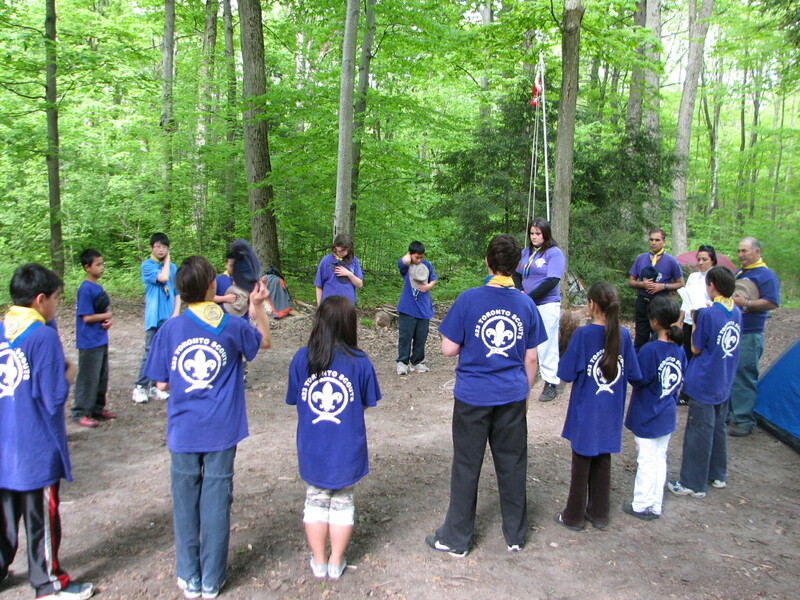 Bruno (far right) leads boys and girls in the Scouting Circle at the beginning of a fun day of camp in May 2009. Over the years, Bruno’s massively popular Scout Troupes have touched the lives of hundreds of kids, so much so that they still come back to visit him as if he were a surrogate father or an older, wiser, contagiously fun friend. Just recently, they organized a shower for a former Scout, who was about to have her first baby. In all things, Bruno gives from his heart. He and his wife often feed the kids with homemade Italian meals and BBQs in the park. He personally drives to pick up the Scouts in his passenger van before meetings and drives kids back home again to ensure their safety. The Troupe often holds fundraisers to pay for scouts’ enrollment fees, uniforms and camping trips, and when that isn’t enough, Bruno gives from his own pocket. He even takes on extra shifts at work to do so. But you can only give so much before you burn out. Bruno’s Scout Troupe had to close this year. He says because there wasn’t enough enough help. The time and organization required to run programs for 28 energetic boys and girls every week is exhausting – especially for the three leaders who are all getting older, he added. The Scout Troupe is trying hard to stay connected even though they don’t have weekly meetings. Just last week they joined other Troupes in the area to deliver more than 300 Toronto Star Santa Claus Boxes of food and gifts to families in need. Bruno, his co-leaders and the Scouts are itching to start meeting again. They are making their own Christmas Wish for volunteers. Here are three ways you can help, by providing transportation for the kids, or you can help with fundraising or at weekly meetings once or twice a month. -If this is something you can do, or would like to speak with Bruno, please contact him via email: camperbruno@hotmail.com or via phone (416) 708-0133.